Big 92.7 FM, Celebrating music Each day and also this World Music Day! MUMBAI: India's No.1 FM Network, known for offering listeners the best music mix, tailor made to suit local tastes will reverberate with music this World Music Day as they promise to offer listeners the best aural pleasure ever! The Stations across the country have put together extremely novel and highly engaging entertainment mix, both on air as well as on ground to ensure listeners are treated to the best musical extravaganza. Music makes for a very integral part of the stations offering, which makes it only natural for the Station to celebrate this day with its listeners. As part of its innovative offerings, BIG 92.7 FM in Mumbai is bringing together ace musicians Shankar-Ehsaan-Loy, and whistling wizards from â€?Whistle Association' who will jam together to create never heard before music which is sure to excite listeners this World Music Day. The Delhi Station will also create similar, tweaking it to meet tastes by getting none other than Rabbi Shergill to jam with the whistlers. Apart from this, listeners can also take part in several musical contests and prove their mettle at singing differently. BIG FM's Hyderabad Station will organize an innovative activity â€“ â€?Play Musical Chair and sing on BIG 92.7 FM', which will see listeners and other audiences sing and win a chance to participate in a gala â€?Musical Chair' on World Music Day In order to shortlist participants, BIG FM RJs will invite sms from listeners and will randomly pick one of them to sing on-air. To promote the activity on-ground, BIG FM's team will organize musical chair games at key city locations and shortlist participants At the grand-finale, participants who have been selected through on-air and on-ground process will play the â€?Gala Musical Chair' along with some key Tollywood celebrities The music of the â€?Gala Musical Chair' game will be played by visually-impaired children from Devnar School. As part of its Music Day Celebrations, BIG FM Chennai will play a host to a special musical orchestra â€“ â€?Raaga Priya Orchestra' which is run by visually challenged people The orchestra which is headed by Mr. M C Comagan, who has given various hit songs to Kollywood Movies. 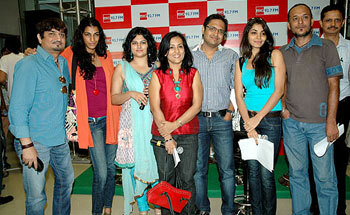 The orchestra members along with BIG FM RJs, will entertain the listeners with some great music and humour. BIG FM Chandigarh being the radio partner of the â€?Kailash Kher' concert to be held in the city, will have the Bollywood singer playing guest at the Station on â€?World Music Day', while interacting with listeners Kailash Kher along with BIG FM's RJs will rock the listeners with some great musical numbers and will interact with them directly. The rest of its stations across the country too are ensuring a music packed day â€“ whether it is hosting a Rock Band or the hosting a musical soiree with students playing music instruments, each station is ensuring they make this day truly musical for its listeners. Speaking on the offerings, Anand Chakravarthy, Senior Vice President â€“ Marketing, BIG 92.7 FM said, "At BIG 92.7 FM, music is a key offering to our listeners which is always a part of our activities - whether it is the recently concluded Dhun Daar T20 or Cricket Mahabharat or our regular programming. World Music Day is an especially key occasion to celebrate music with our listeners, and that is exactly what we are doing. Each of our stations have created unique and innovative platforms which will involve listeners through highly interactive offerings on air and on ground. This World Music Day, our message to listeners is to tune in and celebrate music together with us â€“ truly Suno Sunao, Life Banao."